Turf Valley's casual eatery, The Terrace On The Green, provides the perfect atmosphere for a relaxing snack after a great round of golf, or for a casual business luncheon. The Terrace On The Green is open Monday through Sunday. Lunch is served from 11:00 a.m.; dinner from 5:00 p.m. until 10:00 p.m. Enjoy overstuffed sandwiches, grilled burgers or chicken, fresh salads, gourmet pizza, delicious Buffalo wings, stuffed potato skins and much more! 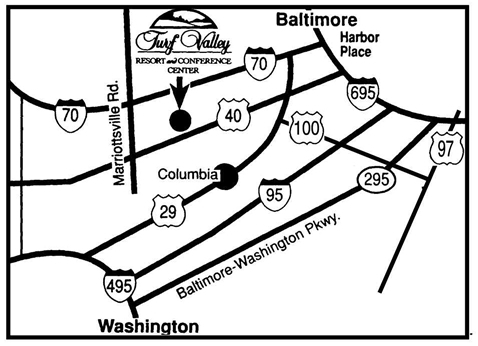 The bar opens at 11:00 a.m.
From Baltimore: Take I-695 to exit 16 (I-70 West toward Frederick). Follow I-70 to exit 83 (Marriottsville Rd.). At the stop sign turn left onto Marriottsville Rd. At the first traffic light, turn left onto Route 40. Go 7/10 mile and turn left onto Turf Valley Rd. Turf Valley's entrance will be on your left. From Annapolis: Take your shortest route to I-695 and use the Baltimore directions to Turf Valley.